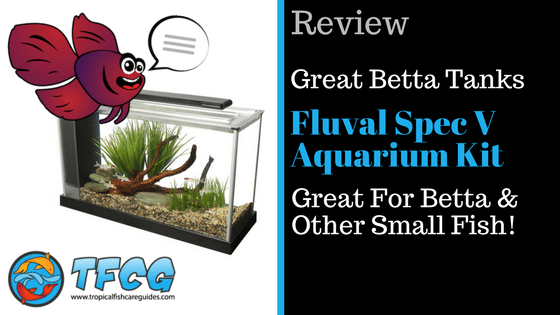 Betta Fish Tank Review: The Fluval Spec V Aquarium Kit – Great For Betta & Other Small Fish! It’s time to ditch the fishbowl and allow your Betta fish to stretch his fins in a new tank. 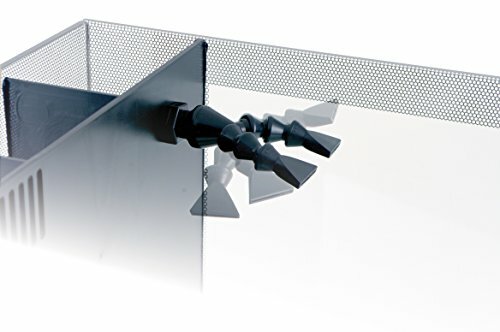 With innovation in aquarium fish tank technology at its core, the Fluval Spec V aquarium kit will be a great addition to fish keepers seeking to up the size and quality of their fish’s habitat. Bettas, guppies, or any other type of small fish will be safe and sound in this tank. And on that note, let’s jump to the meat of our Fluval Spec V aquarium kit review! Overall: Is the Fluval Spec V Aquarium Kit Worth it? Great fish tank for beginners, Betta fish, other small fish and serious fish owners alike. After you read through the instruction manual, setting up your Fluval Spec V tank couldn’t be easier—from the pet store to home set-up in no time. All you do is rinse all the aquarium parts (always avoid using soap! soap is toxic to fish), plug in the filter, the pump, slide in the lights to the light slot and then fill in the tank. Instructions are clearly labeled and laid out easily in multiple languages, making it simple for those who have never set-up a fish tank to properly set up theirs. Then add a few plants, gravel and decor and you’re ready to go. This five-gallon fish tank and its ultra clean water is going to treat your fish much better than a bowl without taking up too much space. With enough planning, this five-gallon fish tank can fit easily into a bedroom or living room while providing the right amount of space for your fish to thrive. Betta fish tank owners can rest assured that their Betta fish will be happy and healthy with the freedom this tank provides. The light is durable and bright, making your fish’s environment much more comfortable. The light is a high-output 7,000 K LED light, allowing you to see a 20% brighter performance and enjoy bolder fish colors with Fluval’s included light. The Fluval Spec V aquarium tank also comes with a 3-stage filter which works like a “water conditioner,” letting your fish enjoy a cleaner environment with less work for you. Fluval has a history for making great filters and have included some great features in this small tank. It’s prowess in mechanical, chemical, and biological filtration means ultra clean water with crystal clear clarity in your Betta tank. Grimy tanks will be few and far in between, especially since the sheer size of this tank means that it will be forgiving if you miss a few days of cleaning. At 16.2 pounds (empty), this tank will be a bit hefty for the not-so-strong out there. However, with that weight comes impeccable durability: the etched-glass and aluminum trim construction of this aquarium ensures prolonged longevity. Just be sure to use this on a stand that’s strong enough to support its weight for an extended period of time and that it’s not in an area where it can be bumped into. It’s sturdy, but not unbreakable. Not the cheapest aquarium tank on the market, but not the most expensive either. The Fluval Spec V aquarium is a solid choice for the people who don’t want to skimp on their next tank but also don’t want to break the bank. You get what you pay for, and that’s solid construction and a durable build at an affordable price. The tank does its job well. The filter, heater, and light source will be sturdy enough to support your Betta fish for years. The strong glass and aluminum build of the body mean that it can deal with scratches and light handling, allowing multiple generations of fish keeping. The filter media may need to be switched out every now and then, but the tank itself should hold up for a long time. Cleaning the fish tank will mean removing the light source to get access to the water. Depending on your personality, this can be a hassle or not an issue at all. Feeding should be easy: just lift the aquarium cover and deposit the food into the water. Issues with the tank, filter & lighting will not be an issue because of the quality of parts Fluval used in this tank. Unfortunately a heater is not included…but luckily for you we reivewed 5 of the most affordable heaters for Betta tanks. As we mentioned, setup for this tank is simple since there isn’t much to worry about. 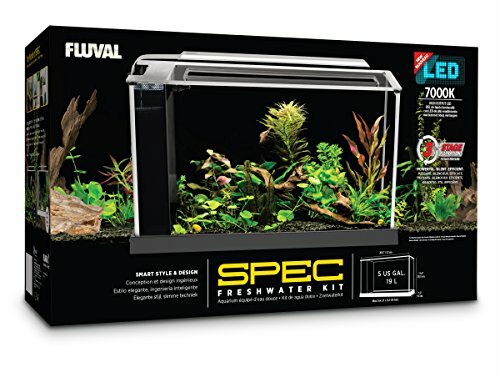 YouTuber Pecktec has an unboxing video and setup for the Fluval Spec V, check it out below. Overall, it’s a high-quality investment for beginner fish keepers, which provides Betta fish with enough space and room and will not take up too much space in your home. With the glass and aluminum body coming in at 16.2 pounds (empty), this aluminum tank will be a durable purchase, not only for your current fish but fish down the line. However, it’s not perfect, as the placement of the light can make the tank hard to clean, and the placement of the heater may look awkward depending on where you to put it. Also, if you use the unaltered filter initially provided with the tank, you may find its current may be too strong for your Betta fish and cause injuries. This is a major concern for owners of long-tailed Bettas or other delicate fish. Your fish may end up getting caught in the filter if you don’t make adjustments. Luckily, many customers have provided their own solutions to slow down the current speed on the review section of the Amazon page. If that doesn’t scare you away, then yes, this tank is worth the investment. It’s solid construction, quiet filter, and bright light means that it will make a great home for your Betta fish. The price isn’t terrible, and you get more for what you pay for. Your Betta fish can enjoy the space and luxury of his new home with the Fluval Spec V aquarium kit. By Jack Dempsey|2018-02-24T20:45:18-06:00January 22nd, 2018|Betta Fish Care|Comments Off on Betta Fish Tank Review: The Fluval Spec V Aquarium Kit – Great For Betta & Other Small Fish!